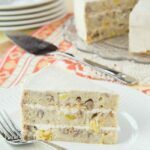 A moist fruit and nut filled gluten free cake sweetened with bananas and honey. Preheat oven to 350°F. Spray three 9-inch cake pans with cooking spray or mist with oil, and line the bottom with parchment paper. In a large bowl, whisk together the almond meal, oat flour, tapioca starch, baking powder, and salt until thoroughly combined. In a medium bowl, whisk together the eggs, oil, honey, milk, vanilla, and cinnamon. Add the wet ingredients to the dry ingredients and fold gently to combine. Stir in the mashed bananas until smooth, the stir in the pineapple and pecans. Pour the batter into the prepared pans and bake for 35-40 minutes, or until slightly browned and firm to the touch. Let cool for 10-15 minutes in the pan on a rack, then remove from the pan and cool to room temperature directly on the rack. Frost with Greek yogurt cream cheese frosting. Combine all of the ingredients in a medium bowl and beat with an electric mixer until thoroughly combined and smooth. Oat flour was made by grinding oats in a food processor or blender until a powder. If any large pieces remain, they can be sifted out.